Unless you have a friend or relative who also happens to be an instructor-level fly fisher, a hands-on fly fishing school is the best way to introduce yourself to fly fishing. If you plan on teaching your spouse to fly fish — so you can both spend your leisure time enjoying the same sport — you should seriously reconsider. Even if you think you are an expert fly fisher, and even if you and your spouse have an excellent relationship, don't try to add "fly-fishing instructor" to your resume. Invest in a qualified professional — a third party — and it will be more enjoyable, and more successful, for both of you. Your spouse is more likely to listen and enjoy learning from a qualified instructor. 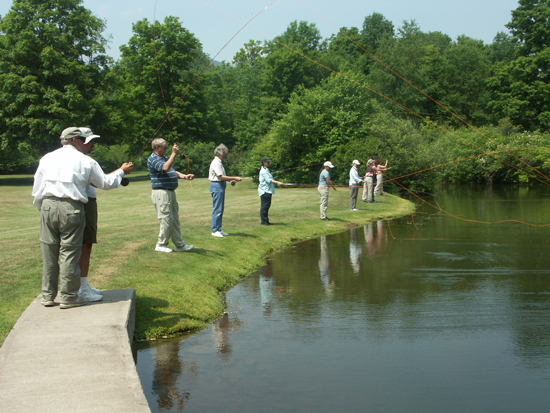 Fly-fishing schools are relatively stress-free because you aren't placed in a fishing situation like you would if you went out and hired a guide for a fishing trip. Schools are normally held on a stream or a pond where instructors can demonstrate, and students can practice casting and presentations. This is the critical element of most schools and what makes them so valuable — it's difficult to learn physical skills like casting from a book or DVD. Fly-fishing schools also have a strong entomology component, where you will observe the aquatic insects trout feed on, and your instructor will show you how to accurately imitate them. Schools should also show you how to tie the knots you need, wade safely, locate fish, make presentations, and release fish safely — much like this issue of Fly Fishing Made Easy, only in person and on the water. Also important is the fact that most fly-fishing schools provide all the tackle you need for the event. If you are just getting started, this is a wonderful "try before you buy" opportunity, where you can discover what equipment works best for you, and what equipment is recommended by local experts. There are literally hundreds of small schools across the country. Most fly shops offer one-day or weekend schools, and many are excellent. Here are a few of the nationally recognized schools we're familiar with — often because the instructors/operators are longtime Fly Fisherman magazine contributors and recognized international experts. The Fly Shop at Redding, California, offers three-day seminars at Antelope Creek Ranch. Students learn practical stream entomology, casting, fly-fishing strategies, knots, and how to hook and release trout on 1½ miles of private water. All the equipment is provided by The Fly Shop. The cost is $945 per person and includes four nights accommodations and all meals. See theflyshop.com for more information. Cathy Beck is one of the most recognizable faces in fly fishing. Cathy and her husband Barry fish around the globe hundreds of days per year, photographing the best destinations on the planet. She has appeared on the cover of Fly Fisherman more than any other person — probably because she always seems to catch inordinately large fish and her husband is always there to catch it on film. Dave and Emily Whitlock together have more than 45 years of fly-fishing teaching experience. Dave designed and directed the L.&apos;„L. Bean fly-fishing school for 10 years before beginning his own programs, and he has taught around the world, authored books and articles, produced videos, and hosted lectures on fly fishing. Dave and Emily offer private one-on-one instruction at their campus in the water-rich Oklahoma Ozarks. Emily is a conservationist and naturalist, holds degrees in botany and biology, is a partner in all of Dave's work and an accomplished casting instructor. A day with Dave is $650 and a day with both Dave and Emily is $900. Instruction includes classroom work, casting and presentation practice on a spring-fed pond, entomology, flowing water presentations, catch-and-release techniques, and more. For more information see davewhitlock.com. Orvis may have pioneered the concept of fly-fishing schools in America with its first school in Manchester, Vermont. The company now has more than a dozen schools across the country at Sandanona, New York; Barnsley Gardens, Georgia; Nemacolin, Pennsylvania; Dogwood Canyon, Missouri; Hot Springs, Virginia; Coeur d'Alene, Idaho; and Ovando, Montana; and the original location at Manchester, Vermont. Orvis also offers saltwater- or warmwater-oriented schools at Cape Cod, Massachusetts; Grande Lakes, Florida; Santa Rosa Beach, Florida; and elsewhere. The student/instructor ratio is 4:1, cost is $470 for a two-day course, $350 for a one-day course. For dates and other specifics see orvis.com. Jim was one of the first fly-fishing guides on the Bow River, Alberta, and has been writing for Fly Fisherman for nearly two decades. Jim and his wife Lynda are another one of those couples lucky enough to fish and teach fly fishing together through much of the year. They conduct their schools at destination locations such as at the Anchor B fly fishing lodge on the Oldman River, Alberta (cost includes accommodations and meals) and on the Crowsnest River. They also have specialty schools such as schools just for women (taught by Lynda), private schools for one or two people, corporate schools, casting-specific schools, and intermediate and advanced schools. For more information see mclennanflyfishing.com. Ralph Cutter is known for his underwater observations of trout and trout behavior. The Sierra Trout Guide and Bugs of the Underworld DVD are just two of Ralph and Lisa's educational contributions to fly fishing. Their California School of Fly fishing — one of the oldest "small" schools in the country — has been in operation since 1981. Small-group lessons for beginners are $649 per person and limited to a maximum of four anglers. See flyline.com more information. Joan Wulff has won casting championships and performed casting exhibitions and seminars around the globe. Her many books, DVDs, and magazine articles simplify fly casting into principles beginners easily understand and advanced casters can use to improve. Her school on the Beaverkill River teaches stream entomology, fishing knots, reading water, tackle know-how, fly selection, approach and presentation, wading, and releasing fish. Lee Wulff's Trout on a Fly and Joan's Fly Casting Techniques are course textbooks. Tuition for the three-day courses is $625. For more information see royalwulff.com.